He was well known for his work with pious lay groups such as the Friends of God and was succeeded by his more circumspect disciples John Tauler and Henry Suso. Since the 19th century, he has received renewed attention. He has acquired a status as a great mystic within contemporary popular spirituality, as well as considerable interest from scholars situating him within the medieval scholastic and philosophical tradition. Eckhart was probably born in the village of Tambach, near Gotha, in the Landgraviate of Thuringia, perhaps between 1250 and 1260. It was previously asserted that he was born to a noble family of landowners, but this originated in a misinterpretation of the archives of the period. In reality, little is known about his family and early life. There is no authority for giving him the Christian name of Johannes, which sometimes appears in biographical sketches: his Christian name was Eckhart; his surname was von Hochheim. 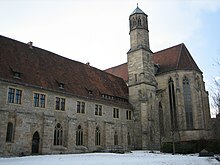 Eckhart joined the Dominicans at Erfurt, probably when he was about eighteen, and it is assumed he studied at Cologne. He may have also studied at the University of Paris, either before or after his time in Cologne. The first solid evidence we have for his life is when on 18 April 1294, as a baccalaureus (lecturer) on the Sentences of Peter Lombard, a post to which he had presumably been appointed in 1293, he preached the Easter Sermon (the Sermo Paschalis) at the Dominican convent of St. Jacques in Paris. In late 1294, Eckhart was made Prior at Erfurt and Provincial of Thuringia. His earliest vernacular work, Reden der Unterweisung (The Talks of Instructions/Counsels on Discernment), a series of talks delivered to Dominican novices, dates from this time (c. 1295–1298). In 1302, he was sent to Paris to take up the external Dominican chair of theology. He remained there until 1303. The short Parisian Questions date from this time. In late 1303 Eckhart returned to Erfurt, and was made Provincial for Saxony, a province which reached at that time from the Netherlands to Livonia. He therefore had responsibility for forty-seven convents in this region. Complaints made against him and the provincial of Teutonia at the general chapter held in Paris in 1306, concerning irregularities among the ternaries, must have been trivial, because the general, Aymeric of Piacenza, appointed him in the following year his vicar-general for Bohemia with full power to set the demoralized monasteries there in order. Eckhart was Provincial for Saxony until 1311, during which time he founded three convents for women there. On 14 May 1311 Eckhart was appointed by the general chapter held at Naples as teacher at Paris. To be invited back to Paris for a second stint as magister was a rare privilege, previously granted only to Thomas Aquinas. Eckhart stayed in Paris for two academic years, until the summer of 1313, living in the same house as William of Paris. Then follows a long period of which it is known only that he spent part of the time at Strasbourg. It is unclear what specific office he held there: he seems chiefly to have been concerned with spiritual direction and with preaching in convents of Dominicans. A passage in a chronicle of the year 1320, extant in manuscript (cf. Wilhelm Preger, i. 352–399), speaks of a prior Eckhart at Frankfurt who was suspected of heresy, and some have referred this to Meister Eckhart. It is unusual that a man under suspicion of heresy would have been appointed teacher in one of the most famous schools of the order, but Eckhart's distinctive expository style could well have already been under scrutiny by his Franciscan detractors. In late 1323 or early 1324, Eckhart left Strasbourg for the Dominican house at Cologne. It is not clear exactly what he did here, though part of his time may have been spent teaching at the prestigious Studium in the city. Eckhart also continued to preach, addressing his sermons during a time of disarray among the clergy and monastic orders, rapid growth of numerous pious lay groups, and the Inquisition's continuing concerns over heretical movements throughout Europe. It appears that some of the Dominican authorities already had concerns about Eckhart's teaching. The Dominican General Chapter held in Venice in the spring of 1325 had spoken out against "friars in Teutonia who say things in their sermons that can easily lead simple and uneducated people into error". This concern (or perhaps concerns held by the archbishop of Cologne, Henry of Virneburg) may have been why Nicholas of Strasbourg, to whom the pope had in 1325 given the temporary charge of the Dominican friaries in Germany, conducted an investigation of Eckhart's orthodoxy. Nicholas presented a list of suspect passages from the Book of Consolation to Eckhart, who responded sometime between August 1325 and January 1326 with a lost treatise Requisitus, which satisfied his immediate superiors of his orthodoxy. Despite this assurance, however, the archbishop in 1326 ordered an inquisitorial process. At this point he issued a Vindicatory Document, providing chapter and verse of what he had been taught. Throughout the difficult months of late 1326, Eckhart had the full support of the local Dominican authorities, as evident in Nicholas of Strasbourg's three official protests against the actions of the inquisitors in January 1327. On 13 February 1327, before the archbishop's inquisitors pronounced their sentence on Eckhart, Eckhart preached a sermon in the Dominican church at Cologne, and then had his secretary read out a public protestation of his innocence. He stated in his protest that he had always detested everything wrong, and should anything of the kind be found in his writings, he now retracts. Eckhart himself translated the text into German, so that his audience, the vernacular public, could understand it. The verdict then seems to have gone against Eckhart. Eckhart denied competence and authority to the inquisitors and the archbishop, and appealed to the Pope against the verdict. He then, in the spring of 1327, set off for Avignon. In Avignon, Pope John XXII seems to have set up two tribunals to inquire into the case, one of theologians and the other of cardinals. Evidence of this process is thin. However, it is known that the commissions reduced the 150 suspect articles down to 28; the document known as the Votum Avenionense gives, in scholastic fashion, the twenty-eight articles, Eckhart's defence of each, and the rebuttal of the commissioners. On 30 April 1328, the pope wrote to Archbishop Henry of Virneburg that the case against Eckhart was moving ahead, but added that Eckhart had already died (modern scholarship suggests he may have died on 28 January 1328). The papal commission eventually confirmed (albeit in modified form) the decision of the Cologne commission against Eckhart. Pope John XXII issued a bull (In agro dominico), 27 March 1329, in which a series of statements from Eckhart is characterized as heretical, another as suspected of heresy. At the close, it is stated that Eckhart recanted before his death everything which he had falsely taught, by subjecting himself and his writing to the decision of the Apostolic See. It is possible that the Pope's unusual decision to issue the bull, despite the death of Eckhart (and the fact that Eckhart was not being personally condemned as a heretic), was due to the pope's fear of the growing problem of mystical heresy, and pressure from his ally Henry II to bring the case to a definite conclusion. We tried to have the censure lifted on Eckhart [...] and were told that there was really no need since he had never been condemned by name, just some propositions which he was supposed to have held, and so we are perfectly free to say that he is a good and orthodox theologian. Only 28 propositions were censured, but they were taken out of their context and impossible to verify, since there were no manuscripts in Avignon. Eckhart was schooled in medieval scholasticism and was well-acquainted with Aristotelianism, Augustinianism, and Neo-Platonism. Although he was an accomplished academic theologian, Eckhart's best-remembered works are his highly unusual sermons in the vernacular. Eckhart as a preaching friar attempted to guide his flock, as well as monks and nuns under his jurisdiction, with practical sermons on spiritual/psychological transformation and New Testament metaphorical content related to the creative power inherent in disinterest (dispassion or detachment). When I preach, I usually speak of detachment and say that a man should be empty of self and all things; and secondly, that he should be reconstructed in the simple good that God is; and thirdly, that he should consider the great aristocracy which God has set up in the soul, such that by means of it man may wonderfully attain to God; and fourthly, of the purity of the divine nature. As Eckhart said in his trial defence, his sermons were meant to inspire in listeners the desire above all to do some good. In this, he frequently used unusual language or seemed to stray from the path of orthodoxy, which made him suspect to the Church during the tense years of the Avignon Papacy. In Eckhart's vision, God is primarily fecund. Out of overabundance of love the fertile God gives birth to the Son, the Word in all of us. Clearly,[e] this is rooted in the Neoplatonic notion of "ebullience; boiling over" of the One that cannot hold back its abundance of Being. Eckhart had imagined the creation not as a "compulsory" overflowing (a metaphor based on a common hydrodynamic picture), but as the free act of will of the triune nature of Deity (refer Trinitarianism). Another bold assertion is Eckhart's distinction between God and Godhead (Gottheit in German, meaning Godhood or Godliness, state of being God). These notions had been present in Pseudo-Dionysius's writings and John the Scot's De divisione naturae, but Eckhart, with characteristic vigor and audacity, reshaped the germinal metaphors into profound images of polarity between the Unmanifest and Manifest Absolute. John Orme Mills notes that Eckhart did not "leave us a guide to the spiritual life like St Bonaventure’s Itinerarium – the Journey of the Soul," but that his ideas on this have to be condensed from his "couple of very short books on suffering and detachment" and sermons. According to Mills, Eckhart's comments on prayer are only about contemplative prayer "detachment." Eckhart was one of the most influential 13th-century Christian Neoplatonists in his day, and remained widely read in the later Middle Ages. Some early twentieth-century writers believed that Eckhart's work was forgotten by his fellow Dominicans soon after his death. In 1960, however, a manuscript ("in agro dominico") was discovered containing six hundred excerpts from Eckhart, clearly deriving from an original made in the Cologne Dominican convent after the promulgation of the bull condemning Eckhart's writings, as notations from the bull are inserted into the manuscript. The manuscript came into the possession of the Carthusians in Basel, demonstrating that some Dominicans and Carthusians had continued to read Eckhart's work. It is also clear that Nicholas of Cusa, Archbishop of Cologne in the 1430s and 1440s, engaged in extensive study of Eckhart. He assembled, and carefully annotated, a surviving collection of Eckhart's Latin works. As Eckhart was the only medieval theologian tried before the Inquisition as a heretic, the subsequent (1329) condemnation of excerpts from his works cast a shadow over his reputation for some, but followers of Eckhart in the lay group Friends of God existed in communities across the region and carried on his ideas under the leadership of such priests as John Tauler and Henry Suso. Eckhart is considered by some to have been the inspirational "layman" referred to in Johannes Tauler's and Rulman Merswin's later writings in Strasbourg where he is known to have spent time (although it is doubtful that he authored the simplistic "Book of the Nine Rocks" published by Merswin and attributed to the layman knight from the north). On the other hand, most scholars consider the "layman" to be a pure fiction invented by Merswin to hide his authorship because of the intimidating tactics of the Inquisition at the time. It has been suspected that his practical communication of the mystical path is behind the influential 14th-century "anonymous" Theologia Germanica, which was disseminated after his disappearance. According to the medieval introduction of the document, its author was an unnamed member of the Teutonic Order of Knights living in Frankfurt. The lack of imprimatur from the Church and anonymity of the author of the Theologia Germanica did not lessen its influence for the next two centuries – including Martin Luther at the peak of public and clerical resistance to Catholic indulgences – and was viewed by some historians of the early 20th century as pivotal in provoking Luther's actions and the subsequent Protestant Reformation. The two eyes of the soul of man cannot both perform their work at once: but if the soul shall see with the right eye into eternity, then the left eye must close itself and refrain from working, and be as though it were dead. For if the left eye be fulfilling its office toward outward things, that is holding converse with time and the creatures; then must the right eye be hindered in its working; that is, in its contemplation. Therefore, whosoever will have the one must let the other go; for 'no man can serve two masters.'" Eckhart was largely forgotten from the sixteenth to the nineteenth centuries, barring occasional interest from thinkers such as Angelus Silesius (1627–1677). For centuries, none of Eckhart's writings were known except a number of sermons, found in the old editions of Johann Tauler's sermons, published by Kachelouen (Leipzig, 1498) and by Adam Petri (Basel, 1521 and 1522). Interest in Eckhart's works was revived in the early nineteenth century, especially by German Romantics and Idealist philosophers. [f] Franz Pfeiffer's publication in 1857 of Eckhart's German sermons and treatises added greatly to this interest. A second important figure in the later nineteenth century for the recovery of Eckhart's works was Heinrich Seuse Denifle, who was the first to recover Eckhart's Latin works, from 1886 onwards. During the late nineteenth and early twentieth century, much Catholic interest in Eckhart was concerned with the consistency of his thought in relation to Neoscholastic thought – in other words, to see whether Eckhart's thought could be seen to be essentially in conformity with orthodoxy as represented by his fellow Dominican Thomas Aquinas. Since the mid-nineteenth century scholars have questioned which of the many pieces attributed to Eckhart should be considered genuine, and whether greater weight should be given to works written in the vernacular, or Latin. Although the vernacular works survive today in over 200 manuscripts, the Latin writings are only found in a handful of manuscripts. Denifle and others have proposed that the Latin treatises, which Eckhart prepared for publication very carefully, were essential to a full understanding of Eckhart. In 1923, Eckhart's Essential Sermons, Commentaries, Treatises and Defense (also known as the Rechtsfertigung, or Vindicatory Document) was re-published. The Defense recorded Eckhart's responses against two of the Inquisitional proceedings brought against him at Cologne, and details of the circumstances of Eckhart's trial. The excerpts in the Defense from vernacular sermons and treatises described by Eckhart as his own, served to authenticate a number of the vernacular works. Although questions remain about the authenticity of some vernacular works, there is no dispute about the genuine character of the Latin texts presented in the critical edition. Since the 1960s debate has been going on in Germany whether Eckhart should be called a "mystic". The philosopher Karl Albert had already argued that Eckhart had to be placed in the tradition of philosophical mysticism of Parmenides, Plato, Plotinus, Porphyry, Proclus and other neo-Platonistic thinkers. Heribert Fischer argued in the 1960s that Eckhart was a mediaeval theologian. Kurt Flasch, a member of the so-called Bochum-school of mediaeval philosophy, strongly reacted against the influence of New Age mysticism and "all kinds of emotional subjective mysticism", arguing for the need to free Eckhart from "the Mystical Flood". He sees Eckhart strictly as a philosopher. Flasch argues that the opposition between "mystic" and "scholastic" is not relevant because this mysticism (in Eckhart's context) is penetrated by the spirit of the University, in which it occurred. Matthew Fox (born 1940) is an American theologian. Formerly a priest and a member of the Dominican Order within the Roman Catholic Church, Fox was an early and influential exponent of a movement that came to be known as Creation Spirituality. The movement draws inspiration from the wisdom traditions of Christian scriptures, and the philosophies of such medieval Catholic visionaries as Hildegard of Bingen, Thomas Aquinas, Saint Francis of Assisi, Julian of Norwich, Dante Alighieri, Meister Eckhart and Nicholas of Cusa, and others. Fox has written a number of articles on Eckhart, and a book titled "Breakthrough: Meister Eckhart's Creation Spirituality in New Translation." The French philosopher Jacques Derrida distinguishes Eckhart's Negative Theology from his own concept of différance although John D. Caputo in his influential 'The Tears and Prayers of Jacques Derrida' emphasises the importance of that tradition for this thought. Meister Eckhart has become one of the timeless heroes of modern spirituality, which thrives on an all-inclusive syncretism. This syncretism started with the colonisation of Asia, and the search of similarities between eastern and western religions. Western monotheism was projected onto eastern religiosity by western orientalists, trying to accommodate eastern religiosity to a western understanding, whereafter Asian intellectuals used these projections as a starting point to propose the superiority of those eastern religions. Early on, the figure of Meister Eckhart has played a role in these developments and exchanges. Renewed academic attention to Eckhart has attracted favorable attention to his work from contemporary non-Christian mystics. Eckhart's most famous single quote, "The Eye with which I see God is the same Eye with which God sees me", is commonly cited by thinkers within neopaganism and ultimatist Buddhism as a point of contact between these traditions and Christian mysticism. If we turn from the forms, produced by external circumstances, and go to the root of things, we shall find that Sakyamuni and Meister Eckhart teach the same thing; only that the former dared to express his ideas plainly and positively, whereas Eckhart is obliged to clothe them in the garment of the Christian myth, and to adapt his expressions thereto. Buddha, Eckhart, and I all teach essentially the same. A major force in the mutual influence of eastern and western ideas and religiosity was the Theosophical Society, which also incorporated Eckhart in its notion of Theosophy. It searched for ancient wisdom in the east, spreading eastern religious ideas in the west. One of its salient features was the belief in "Masters of Wisdom",[h] "beings, human or once human, who have transcended the normal frontiers of knowledge, and who make their wisdom available to others". The Theosophical Society also spread western ideas in the east, aiding a modernisation of eastern traditions, and contributing to a growing nationalism in the Asian colonies. The Theosophical Society had a major influence on Hindu reform movements. [i] A major proponent of this "neo-Hinduism", also called "neo-Vedanta", was Vivekananda (1863–1902) who popularised his modernised interpretation of Advaita Vedanta in the 19th and early 20th century in both India and the west, emphasising anubhava ("personal experience") over scriptural authority. Vivekananda's teachings have been compared to Eckhart's teachings. In the 20th century, Eckhart's thoughts were also compared to Shankara's Advaita Vedanta by Rudolf Otto in his Mysticism East and West. According to King, the aim of this work was to redeem Eckhart's mysticism in Protestant circles, attempting "to establish the superiority of the German mysticism of Eckhart over the Indian mysticism of Sankara". The Theosophical Society also had a major influence on Buddhist modernism, and the spread of this modernised Buddhism in the west. Along with H. S. Olcott and Anagarika Dharmapala, Helena P. Blavatsky was instrumental in the Western transmission and revival of Theravada Buddhism. In 1891, Karl Eugen Neumann, who translated large parts of the Tripitaka, found parallels between Eckhart and Buddhism, which he published in Zwei buddhistische Suttas und ein Traktat Meister Eckharts ("Two Buddhist Suttas and a treatise of Meister Eckhart"). D.T. Suzuki, who joined the Theosophical Society Adyar and was an active Theosophist, discerned parallels between Eckhart's teachings and Zen Buddhism in his Mysticism:Christian and Buddhist, drawing similarities between Eckhart's "pure nothingness" (ein bloss nicht) and sunyata. Shizuteru Ueda, a third generation Kyoto School philosopher and scholar in medieval philosophy showed similarities between Eckhart's soteriology and Zen Buddhism in an article. On the question of "Emptiness" and Eckhart's view (claimed as parallel to Buddhist emphasis "on the emptiness of all 'composite things'") that only a perfectly released person, devoid of all, comprehends, "seizes", God, that the Buddhist "emptiness" seems to concern man's relation to things while Eckhart's concern is with what is "at the end of the road opened by detachment [which is] the mind espouses the very movement of the divine dehiscence; it does what the Godhead does: it lets all things be; not only must God also abandon all of his own—names and attributes if he is to reach into the ground of the mind (this is already a step beyond the recognition of the emptiness of all composite things), but God's essential being ��� releasement – becomes the being of a released man." You know what he [Eckhart] said? The only thing that burns in Hell is the part of you that won't let go of your life; your memories, your attachments. They burn 'em all away. But they're not punishing you, he said. They're freeing your soul. [...] If you're frightened of dying and holding on, you'll see devils tearing your life away. But if you've made your peace then the devils are really angels, freeing you from the Earth. [...]your own are burning and your memories and you don't want to leave them. Everything will burn to the end, you suffer, but nobody is punishing you, they are just setting your soul free. Don't be afraid because while you fear death they will rend your soul like demons. Only calm down and you will see the angels who are setting you free and then you will be free. [...] Meister Eckhart would not even admit that God was good [...] Eckhart's position was that anything that was good can become better, and whatever may become better may become best. God cannot be referred to as "good", "better", or best because He is above all things. If a man says that God is wise, the man is lying because anything that is wise can become wiser. Anything that a man might say about God is incorrect, even calling Him by the name of God. God is "superessential nothingness" and "transcendent Being" [...] beyond all words and beyond all understanding. The best a man can do is remain silent, because anytime he prates on about God, he is committing the sin of lying. The true master knows that if he had a God he could understand, He would never hold Him to be God. I can't help thinking you'd make a damn site better-adjusted actor if Seymour and I hadn't thrown in the Upanishads and the Diamond Sutra and Eckhart and all our other old loves with the rest of your recommended reading when you were small. The third movement of John Adams's Harmonielehre symphony (1985) is titled 'Meister Eckhart and Quackie', which imagines the mystic floating through space with the composer's daughter Emily (nicknamed Quackie) on his back whispering secrets of grace in his ear. The publication of the modern critical edition of Eckhart's German and Latin works began in 1936, and is nearly complete. One difficulty with Eckhart's Latin writings is that they clearly represent only a small portion of what he planned to write. Eckhart describes his plans to write a vast Opus Tripartitum (Three-Part Work). Unfortunately, all that exists today of the first part, the Work of Propositions, is the Prologue illustrating the first proposition (with Eckhart intending the first part alone to consist of over one thousand propositions). The second part, called the Work of Questions, no longer exists. The third part, the Work of Commentaries, is the major surviving Latin work by Eckhart, consisting of a Prologue, six commentaries, and fifty-six sermons. It used to be thought that this work was begun while Eckhart was in Paris between 1311 and 1313; however, recent manuscript discoveries mean that much of what survives must be dated to before 1310. The early Quaestiones Parisiensis (Parisian Questions). Prologus generalis in Opus tripartitium (General Prologue to the Three-Part Work). Prologus in Opus propositionum (Prologue to the Work of Propositions). Prologus in Opus expositionum (Prologue to the Work of Commentaries). Expositio Libri Genesis (Commentary on the Book of Genesis). Liber Parabolorum Genesis (Book of the Parables of Genesis). Expositio Libri Exodi (Commentary on the Book of Exodus). Expositio Libri Sapientiae (Commentary on the Book of Wisdom). Sermones et Lectiones super Ecclesiastici c.24:23–31 (Sermons and Lectures on the Twenty-fourth chapter of Ecclesiasticus). Various sermons, including some preserved in the collection Paradisus anime intelligentis (Paradise of the Intelligent Soul/Paradise of the Intellectual Soul). Although not composed by Eckhart, also relevant are the Vatican archive materials relating to Eckhart's trial, the Votum theologicum (or Opinion) of the Avignon commission who investigated Eckhart, and the bull In agro dominico. Questions concerning the authenticity of the Middle High German texts attributed to Eckhart are much greater than for the Latin texts. The problems involve not only whether a particular sermon or treatise is to be judged authentic or pseudonymous, but also, given the large number of manuscripts and the fragmentary condition of many of them, whether it is even possible to establish the text for some of the pieces accepted as genuine. Eckhart's sermons are versions written down by others from memory or from notes, meaning that the possibility for error was much greater than for the carefully written Latin treatises. The critical edition of Eckhart's works traditionally accepted 86 sermons as genuine, based on the research done by its editor Josef Quint (1898-1976) during the 20th century. Of these, Sermons 1–16b are proved authentic by direct citation in the Defense. Sermons 17–24 have such close textual affinities with Latin sermons recognised as genuine that they are accepted. Sermons 25–86 are harder to verify, and judgements have been made on the basis of style and content. Georg Steer took over the editorship in 1983. Between 2003 and 2016, the critical edition under Georg Steer added another 30 vernacular sermons (Nos. 87 to 117) in volumes 4.1 and 4.2. Because six sermons exist in an A and B version (5a-b, 13-13a, 16a-b, 20a-b, 36a-b und 54a-b) the final total of vernacular sermons is 123 (numbered consecutively from 1 to 117). The longest of these, the Reden der Unterweisung (Counsels on Discernment/Discourses on Instruction/Talks of Instruction), is probably Eckhart's earliest surviving work, a set of spiritual instructions that he gave to young Dominicans in the 1290s. It was clearly a popular work, with fifty-one manuscripts known. A second vernacular treatise, the Liber Benedictus (Book 'Benedictus' ), in fact consists of two related treatises – firstly, Daz buoch der götlîchen trœstunge(The Book of the Divine Consolation), and secondly, a sermon entitled Von dem edeln menschen (Of the Nobleman). The final vernacular treatise accepted as genuine by the critical edition is entitled Von Abgescheidenheit (On Detachment). However, this treatise is generally today not thought to be written by Eckhart. Meister Eckhart: Teacher and Preacher, trans. and ed. by Bernard McGinn and Frank Tobin, New York and London: Paulist Press/SPCK, 1987. Otto Karrer Meister Eckhart Speaks The Philosophical Library, Inc. New York, 1957. Meister Eckhart's Book of the Heart: Meditations for the Restless Soul, by Jon M. Sweeney and Mark S. Burrows, Charlottesville, VA: Hampton Roads, 2017. ^ Meister is German for "Master", referring to the academic title Magister in theologia that he obtained in Paris. ^ His "Defence" is famous for his reasoned arguments to all challenged articles of his writing, and his refutation of heretical intent. ^ No record of his death or burial site has ever been discovered. ^ Aside from a rather striking metaphor of "fertility"
^ Franz von Baader (1765–1841), for instance, studied Eckhart in the early 19th century. Von Baader] was a German Roman Catholic philosopher and theologian. He studied under Abraham Gottlob Werner at Freiberg, travelled through several of the mining districts in north Germany, and for four years, 1792–1796, resided in England. There he became acquainted with the ideas of David Hume, David Hartley and William Godwin, which were all distasteful to him. But he also came into contact with the mystical speculations of Meister Eckhart, Louis Claude de Saint-Martin (1743–1803), and above all those of Jakob Boehme, which were more to his liking. In 1796 he returned from England, and came into contact with Friedrich Schelling, and the works he published during this period were manifestly influenced by that philosopher. ^ And he called his poodle "Atman". ^ The Theosophical Society and the Arya Samaj were united from 1878 to 1882, as the Theosophical Society of the Arya Samaj. ^ Dusen: "[t]he counterpoint to this enormously exposed and public life is Eckhart and Jan van Ruysbroek. They really give me balance and-a more necessary sense of humor." Henry P van Dusen. Dag Hammarskjöld. A Biographical Interpretation of Markings. Faber and Faber. London 1967 pp.49–50. ^ Bernard McGinn, The Mystical Thought of Meister Eckhart, (New York: Crossroad Publishing Company, 2001), p.2, points out that previous scholarship which had placed Eckhart's birth in Hochheim is incorrect: Hochheim is used in the sources to indicate Eckhart's family name, not his birthplace. ^ Walter Senner, ‘Meister Eckhart’s Life, Training, Career, and Trial’ in Jeremiah Hackett (ed. ), A Companion to Meister Eckhart (Leiden: Brill, 2012), 7–84. ^ Meister Eckhart, The Essential Sermons, Commentaries, Treatises and Defense, trans. and ed. by Bernard McGinn and Edmund Colledge, New York: Paulist Press, 1981, p.5. ^ The evidence for Eckhart's studies in Cologne is similarly circumstantial as recounted in Meister Eckhart, The Essential Sermons, Commentaries, Treatises and Defense, trans. and ed. by Bernard McGinn and Edmund Colledge, New York: Paulist Press, 1981, p.7. ^ The Parisian Questions were first discovered in 1927. They are translated with an introduction in Armand Maurer, ed., Master Eckhart: Parisian Questions and Prologues, (Toronto: Pontifical Institute of Medieval Studies, 1974). ^ On the possible dating of the works written in this period, see McGinn, Eckhart, pp.5–9. ^ cf. Urkundenbuch der Stadt Strassburg, iii. 236. ^ a b c Meister Eckhart, The Essential Sermons, Commentaries, Treatises and Defense, trans. and ed. by Bernard McGinn and Edmund Colledge, New York: Paulist Press, 1981, p.10. ^ a b cf. the document in Preger, i. 471; more accurately in ALKG, ii. 627 sqq. ^ In the early twentieth century, the suspicion of Eckhart was often put down to tensions between Dominicans and Franciscans. This narrative, however, has been replaced by one which emphasises the broader context of fears concerning the Heresy of the Free Spirit. See Bernard McGinn, The Harvest of Mysticism, (2005), p.103. ^ The general assumption in modern scholarship on Eckhart has been that the date of Eckhart's death is lost. McGinn, Eckhart, (2001), p.17, however, trusts the argument of Walter Senner that a seventeenth-century Dominican source noted that Eckhart was remembered in German convents on 28 January – suggesting this day in 1328 was the date of his death. Some early twentieth-century writers suggested Eckhart may have not in fact died, but continued his ministry in anonymity, but there is no single medieval source that supports this suspicion. ^ The bull is given complete in ALKG, ii. 636–640). ^ McGinn, Eckhart, (2001), p.18. ^ a b "Meister Eckhart rehabilitated by the Pope". Academici.com. Retrieved 2014-02-21. ^ As McGinn, Eckhart, p.1, points out, about three hundred manuscripts containing Eckhart's German sermons, both authentic and pseudonymous, survive. ^ Meister Eckhart, The Essential Sermons, Commentaries, Treatises and Defense, trans. and ed. by Bernard McGinn and Edmund Colledge, New York: Paulist Press, 1981, p.19. ^ Meister Eckhart, The Essential Sermons, Commentaries, Treatises and Defense, trans. and ed. by Bernard McGinn and Edmund Colledge, New York: Paulist Press, 1981, p.20. ^ Hackett 2012, p. xxvii. ^ Ffytche 2011, p. 33. ^ Mention could also be made of Franz Jostes, Meister Eckhart und seine Junger, ungedruckte Texte zur Geschichte der deutschen Mystik (Collectanea Friburgensia, iv., Freiburg, 1895). ^ Meister Eckhart, The Essential Sermons, Commentaries, Treatises and Defense, trans. and ed. by Bernard McGinn and Edmund Colledge, New York: Paulist Press, 1981, p.62. ^ Meister Eckhart, The Essential Sermons, Commentaries, Treatises and Defense, trans. and ed. by Bernard McGinn and Edmund Colledge, New York: Paulist Press, 1981, p.63. ^ Meister Eckhart, The Essential Sermons, Commentaries, Treatises and Defense, trans. and ed. by Bernard McGinn and Edmund Colledge, New York: Paulist Press, 1981, p.64. ^ Hackett 2012, p. xxii. ^ a b c d e Hackett 2012, p. xxiii. ^ Hackett 2012, p. xxiv. ^ a b Royce, Josiah (1898). "Meister Eckhart". Studies of good and evil : a series of essays upon problems of philosophy and life. New York: D. Appleton. pp. 261–297. OCLC 271174795. ^ a b c d King 2002. ^ a b Renard 2010, p. 178. ^ a b King 2002, p. 125. ^ Renard 2010, p. 185-188. ^ Partridge 2006, p. 3, note 2. ^ Renard 2010, p. 189-193. ^ a b Michaelson 2009, p. 79-81. ^ a b Rambachan 1994, p. 1. ^ Ganapathy 2003, p. 247. ^ King 2002, p. 125-128. ^ King 2002, p. 126. ^ Gombrich 1996, p. 185-188. ^ Fields 1992, p. 83-118. ^ Moran 2012, p. 672. ^ a b c Schurmann 2001, p. 217. ^ King 2002, p. 156. ^ Schurmann 2001, p. 218. ^ Schurmann 2001, p. 219. ^ Salinger, J.D (1955). Franny and Zooey. Boston: Little Brown and Company. pp. 59–60. ISBN 0-316-76949-5. ^ Meister Eckhart: Die deutschen und lateinischen Werke. Herausgegeben im Auftrage der Deutschen Forschungsgemeinschaft. Stuttgart and Berlin: Verlag W. Kohlhammer, 11 Vols., 1936–. The Latin works comprise 6 volumes (widely referred to as LW1–6), while the German works comprise 5 volumes (widely referred to as DW1–5). ^ Meister Eckhart, The Essential Sermons, Commentaries, Treatises and Defense, trans. and ed. by Bernard McGinn and Edmund Colledge, New York: Paulist Press, 1981, p.64. This Prologue exists in two manuscripts discovered by Denifle – one discovered in Erfurt in 1880, and the other in Kues in 1886. ^ Meister Eckhart, The Essential Sermons, Commentaries, Treatises and Defense, trans. and ed. by Bernard McGinn and Edmund Colledge, New York: Paulist Press, 1981, p.65. ^ Bernard McGinn, The Harvest of Mysticism, (2005), p.98. ^ LW 1:27–83. The English translation is Armand Maurer, ed., Master Eckhart: Parisian Questions and Prologues, Toronto, Canada: Pontifical Institute of Medieval Studies, 1974. ^ LW 1:148–165. An English translation is in Armand Maurer, ed., Master Eckhart: Parisian Questions and Prologues, Toronto, Canada: Pontifical Institute of Medieval Studies, 1974, pp.77–104. ^ LW 1:185–444. The Prologue and the commentary on Genesis 3 are translated into English in Meister Eckhart, The Essential Sermons, Commentaries, Treatises and Defense, trans. and ed. by Bernard McGinn and Edmund Colledge, New York: Paulist Press, 1981, pp.82–121. ^ LW 2:1–227. This is translated into English in its entirety in Meister Eckhart: Teacher and Preacher, trans. and ed. by Bernard McGinn and Frank Tobin, New York and London: Paulist Press/SPCK, 1987, pp.41–146. ^ LW 2:29–300. The commentary on Ecclesiasticus 24.29 is translated into English in Meister Eckhart: Teacher and Preacher, trans. and ed. by Bernard McGinn and Frank Tobin, New York and London: Paulist Press/SPCK, 1987, pp.174–181. ^ LW 3. The commentary on John 1:1–14 is translated into English in Meister Eckhart, The Essential Sermons, Commentaries, Treatises and Defense, trans. and ed. by Bernard McGinn and Edmund Colledge, New York: Paulist Press, 1981, pp.122–173. The commentary on John 14.8 is translated into English in Meister Eckhart: Teacher and Preacher, trans. and ed. by Bernard McGinn and Frank Tobin, New York and London: Paulist Press/SPCK, 1987, pp.182–205. ^ Markus, Professor (2011-04-22). "LW4. An extensive list of English translations of the sermons". Markusvinzent.blogspot.co.uk. Retrieved 2014-02-21. ^ Around half of the 64 sermons in the Paradisus were by Eckhart, with the majority contributed by Dominicans. On the origin and purpose of the Paradisus (with dates around 1330–40 generally suggested), see Bernard McGinn, The Harvest of Mysticism, (2005), p.321–2 (which reverses some of the arguments of McGinn (2001). ^ Selections are translated into English in Meister Eckhart, The Essential Sermons, Commentaries, Treatises and Defense, trans. and ed. by Bernard McGinn and Edmund Colledge, New York: Paulist Press, 1981, pp.71–76. ^ Meister Eckhart, The Essential Sermons, Commentaries, Treatises and Defense, trans. and ed. by Bernard McGinn and Edmund Colledge, New York: Paulist Press, 1981, p. 66. ^ "Josef Quint". Eckhart.de. 2017-07-24. Retrieved 2017-07-24. ^ Markus, Professor (2011-04-22). "An extensive list of English translations of the sermons". Markusvinzent.blogspot.co.uk. Retrieved 2014-02-21. ^ "Georg Steer". Eckhart.de. 2017-07-24. Retrieved 2017-07-24. ^ "Die deutschen Werke". Eckhart.de. 2017-07-24. Retrieved 2017-07-24. ^ "Predigten". Eckhart.de. 2017-08-22. Retrieved 2018-02-12. ^ Bernard McGinn, The Harvest of Mysticism, (2005), p.95. ^ DW 5:400–434. All four vernacular treatises are translated into English in Meister Eckhart, The Essential Sermons, Commentaries, Treatises and Defense, trans. and ed. by Bernard McGinn and Edmund Colledge, New York: Paulist Press, 1981. ^ Bernard McGinn, The Harvest of Mysticism, (2005), p.632. Herman Büttner, ed., Schriften und Predigten, vol. 1. Jena: Eugen Diederichs, 1903. Herman Büttner, ed., Schriften und Predigten, vol. 2. Jena: Eugen Diederichs, 1909. Augustine Daniels, O.S.B., ed., "Eine lateinische Rechtfertigungsschrift des Meister Eckharts", Beiträge zur Geschichte der Philosophie des Mittelalters, 23, 5 (Münster, 1923): 1 – 4, 12 – 13, 34 – 35, 65 – 66. Ganapathy (2003), The Way of the Siddhas. In: K. R. Sundararajan, Bithika Mukerji (2003), Hindu Spirituality, Motilal Banarsidass Publ. Franz Jostes, ed., Meister Eckhart und seine Jünger: Ungedruckte Texte zur Geschichte der deutschen Mystik. Berlin: De Gruyter, 1972 (Series: Deutsche Neudrucke Texte des Mittelalters). Thomas Kaepelli, "Kurze Mitteilungen über mittelalterliche Dominikanerschriftsteller", Archivum Fratrum Praedicatorum 10, (1940), pp. 293 – 94. Thomas Kaepelli, Scriptores ordinis Praedicatorum medii aevi. Vol. I (A-F). Rome, 1970. Gustav Landauer, ed. and trans. Meister Eckharts mystische Schriften. Berlin: Karl Schnabel, 1903. M.H. Laurent, "Autour du procés de Maître Eckhart. Les documents des Archives Vaticanes", Divus Thomas (Piacenza) 39 (1936), pp. 331 – 48, 430 – 47. Franz Pelster, S.J., ed., Articuli contra Fratrem Aychardum Alamannum, Vat. lat. 3899, f. 123r – 130v, in "Ein Gutachten aus dem Eckehart-Prozess in Avignon", Aus der Geistewelt des Mittelalters, Festgabe Martin Grabmann, Beiträge Supplement 3, Munster, 1935, pp. 1099–1124. Franz Pfeiffer, ed. Deutsche Mystiker des vierzehnten Jahrhunderts, vol. II: Meister Eckhart. 2nd ed. Göttingen: Vandenhoeck, 1906. Josef Quint, ed. and trans. Meister Eckehart: Deutsche Predigten und Traktate, Munich: Carl Hanser, 1955. Josef Quint, ed., Textbuch zur Mystik des deutschen Mittelalters: Meister Eckhart, Johannes Tauler, Heinrich Seuse, Halle/Saale: M. Niemeyer, 1952. Rubin, Bruce Joel, Jacob's Ladder. Mark Mixson, general editor, The Applause Screenplay Series, Applause Theatre Book Publishers, 1990. ISBN 1-55783-086-X. Gabriel Théry, "Édition critique des piéces relatives au procés d'Eckhart continues dans le manuscrit 33b de la Bibliothèque de Soest", Archives d'histoire littéraire et doctrinal du moyen âge, 1 (1926), pp. 129 – 268. James Midgely Clark, Meister Eckhart: An Introduction to the Study of His Works with an Anthology of His Sermons, Edinburgh: Thomas Nelson, 1957. Matthew Fox, ed., Breakthrough: Meister Eckhart's Creation Spirituality in New Translation, Garden City, New York: Doubleday, 1980. Jeanne Ancelet-Hustache, Master Eckhart and the Rhineland Mystics, New York and London: Harper and Row/ Longmans, 1957. Leonardo Vittorio Arena, The Shadows of the Masters, ebook, 2013. James M. Clark, trans., Henry Suso: Little Book of Eternal Wisdom and Little Book of Truth, London: Faber, 1953. Cesare Catà, Il Cardinale e l'Eretico. Nicola Cusano e il problema della eredità "eterodossa" di Meister Eckhart nel suo pensiero, in "Viator. Medieval and Renaissance Studies", UCLA University, Volume 41, No.2 (2010), pp. 269–291. Oliver Davies, God Within: The Mystical Tradition of Northern Europe, London: Darton, Longman and Todd, 1988. Oliver Davies, Meister Eckhart: Mystical Theologian, London: SPCK, 1991. Eckardus Theutonicus, homo doctus et sanctus, Fribourg: University of Fribourg, 1993. Robert K. Forman, Meister Eckhart: Mystic as Theologian, Rockport, Massachusetts/Shaftesbury, Dorset: Element Books, 1991. Gundolf Gieraths, O.P., '"Life in Abundance: Meister Eckhart and the German Dominican Mystics of the 14th Century", Spirituality Today Supplement, Autumn, 1986. Joel F. Harrington, “Dangerous Mystic: Meister Eckhart’s Path to the God Within”, New York: Penguin Press, 2018. Aldous Huxley, The Perennial Philosophy: An Interpretation of the Great Mystics, East and West, New York: HarperCollins, 1945. Amy Hollywood, The Soul as Virgin Wife: Mechthild of Magdeburg, Marguerite Porete, and Meister Eckhart, Notre Dame and London: University of Notre Dame Press, 1996. Rufus Jones, The Flowering of Mysticism in the Fourteenth Century, New York: Hafner Publishing Co., 1971 (facsimile of 1939 ed.). Bernard McGinn, "Eckhart's Condemnation Reconsidered" in The Thomist, vol. 44, 1980. Bernard McGinn, ed., Meister Eckhart and the Beguine Mystics Hadewijch of Brabant, Mechthild of Magdeburg, and Marguerite Porete, New York: Continuum, 1994. Ben Morgan. On Becoming God: Late Medieval Mysticism and the Modern Western Self. New York: Fordham UP, 2013. Cyprian Smith, The Way of Paradox: Spiritual Life as Taught by Meister Eckhart, New York: Paulist Press, 1988. Frank Tobin, Meister Eckhart: Thought and Language, Philadelphia: University of Pennsylvania Press, 1986. Denys Turner, The Darkness of God: Negativity in Christian Mysticism, Cambridge: Cambridge University Press, 1995. Winfried Trusen, Der Prozess gegen Meister Eckhart, Fribourg: University of Fribourg, 1988. Andrew Weeks, German Mysticism from Hildegard of Bingen to Ludwig Wittgenstein: A Literary and Intellectual History, Albany: State University of New York Press, 1993. Richard Woods, O.P., Eckhart's Way, Wilmington, Delaware: Glazier, 1986 (Collegeville, Minnesota: Liturgical Press, 1991). Richard Woods, O.P., Meister Eckhart: The Gospel of Peace and Justice, Tape Cassette Program, Chicago: Center for Religion & Society, 1993. Richard Woods, O.P., Meister Eckhart: Master of Mystics (London, Continuum, 2010). Saeed Zarrabi-Zadeh, Practical Mysticism in Islam and Christianity: A Comparative Study of Jalal al-Din Rumi and Meister Eckhart, London and New York: Routledge, 2016. Wikimedia Commons has media related to Meister Eckhart. Meister Eckhart's Sermons translated into English by Claud Field, at Christian Classics Ethereal Library. Mojsisch, B.; Summerell, O.F. "Meister Eckhart". In Zalta, Edward N. Stanford Encyclopedia of Philosophy. Brown, Arthur, "The Man From Whom God Hid Nothing." The Meister Eckhart Site, including full text of the papal bull against Meister Eckhart. "Meister Eckhart". Repertorium "Historical Sources of the German Middle Ages" (Geschichtsquellen des deutschen Mittelalters).